During the Apple Special Event that took place today Apple unveiled their new and highly anticipated Apple iOS 8 mobile operating system which builds on the previous Apple iOS 7 operating system. Apple’s iOS 8 operating system includes new notification features that allows you to easily access your messages and has brought with it the new Safari layout that is already available on the iPhone with iOS 7 to the iPad within iOS 8 showing your favourite and most used web pages. Other new features within iOS 8 include the ability to swipe and delete or flag email messages on your iPad and the ability to hide a messages with a quick swipe down to keep them as a draft, returning to it with a tap to the bottom of the screen. 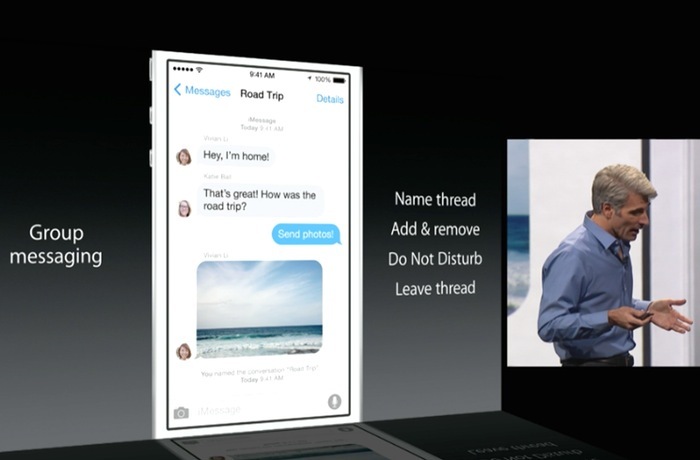 You can even sort messages directly from the home screen on your iPhone or iPad. The new notification features that have been unveiled by Apple today will also apply to third party apps and Apple now provides quick access to your favourite contacts with a double tap on the home button, together with the already available running apps. With the updated iPad email system Apple has made it even easier to add events to your calendar and even prompts you when an event can be added. Flagging has also been enhanced on the iPad as well as the ability to quickly delete messages with a quick swipe. Spotlight has also been updated and the introduction of a new keyboard features via Quick Type that provide easy access to special characters. Messaging has also been handed allows users to remove themselves from a thread if required. Check back and we will go through all the new features in Apple iOS 8 in detail during the next 24 hours.